Sparkle up your riding style with customized boot socks. Markers will color Image only. 4 permanent markers and 1 pair 100% Nylon stretch boot socks. Easy to color. Everyone is an artist. Colors will not wash off. 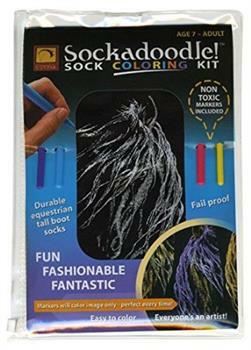 SOCK COLORING KIT - FUN! FASHIONABLE! FANTASTIC!